Every year since Nora could understand Halloween, I have made her a homemade Halloween costume. When Zara came along, I increased to making homemade costumes for two and loved it. Especially when they went together perfectly. My mom made many of my Halloween costumes as a child and I love passing on the tradition of trick-or-treating in something unique and made with love. The girls both have a fascination with robots right now (you should hear Zara walking around saying, ” I. Am. A. Robot.” – it’s hilarious), so when Nora suggested that they be robots this year, I got excited envisioning a costume that they could help make – something along the lines of cardboard boxes and tinfoil with lids glued on. It would have been the perfect family activity/craft project/unique costume rolled into one, and I was all set to work on it early last week. As it tends to go, when we make plans the universe often has other things in mind, and last week homemade Halloween costumes just started to feel like more than I could handle between work, AWE, and the fact that we bought a house and moved last week. After we finally sold our house in Wyoming last spring, we spent the summer doing a lot of soul searching and deciding what we wanted to do and where we wanted to be. We had paid off our student loans and sold the house, which meant for the first time ever we were completely debt free. It was incredibly freeing to know we could do whatever we wanted to do and we spent many hours musing over all the possibilities for the future. One thing we knew for sure is that we really like Fort Collins, the school that Nora goes to, and the people we have met here. We agreed that no matter what, we want to give the girls a “hometown.” Chris and I have been married for eight years and we have lived in five states; it was time to commit to an area, no matter what, and to be settled for the long run. Once we knew that this is where we want to live long term, it only made sense to start exploring buying again (despite the disaster that was our first home buying experience), and late in the summer we decided to take the plunge. We went under contract on a house at the end of August and just as quickly, the deal fell through, then we jumped on another one. Because of the first house situation, we kept it pretty much underwraps, which was just as well when the lender kept missing deadlines and the closing was delayed by five days. We did finally close last Tuesday and then had to deal with the craziness of trying to move in the middle of the work week + having our rental spotless by Saturday + experiencing the girls’ first bout of lice (on moving day, no less) – which was why Thursday night I finally said that I just could not make costumes. I probably could have pushed through to do it, but I just wasn’t mentally there, so I told the girls that they needed to look through things that we already had. Nora decided to be a movie star – just so she could wear makeup – and Zara was a ballerina. 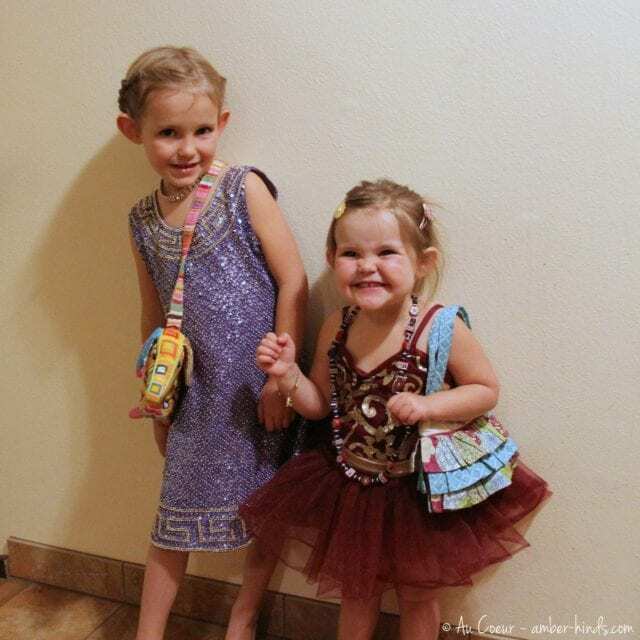 Thank goodness for hand-me-down fancy dresses and dance recital costumes! I was a little sad to not have adorable mini-robots, but they couldn’t have cared less. We trick-or-treated about 10 houses (which turned out to be a fabulous way to meet our new neighbors), then handed out candy to other kids while eating quite a bit ourselves, before heading to bed early after a long day spent cleaning and transplanting plants. I didn’t make homemade Halloween costumes, and we all had a wonderful time anyway…something to keep in mind next year…maybe?